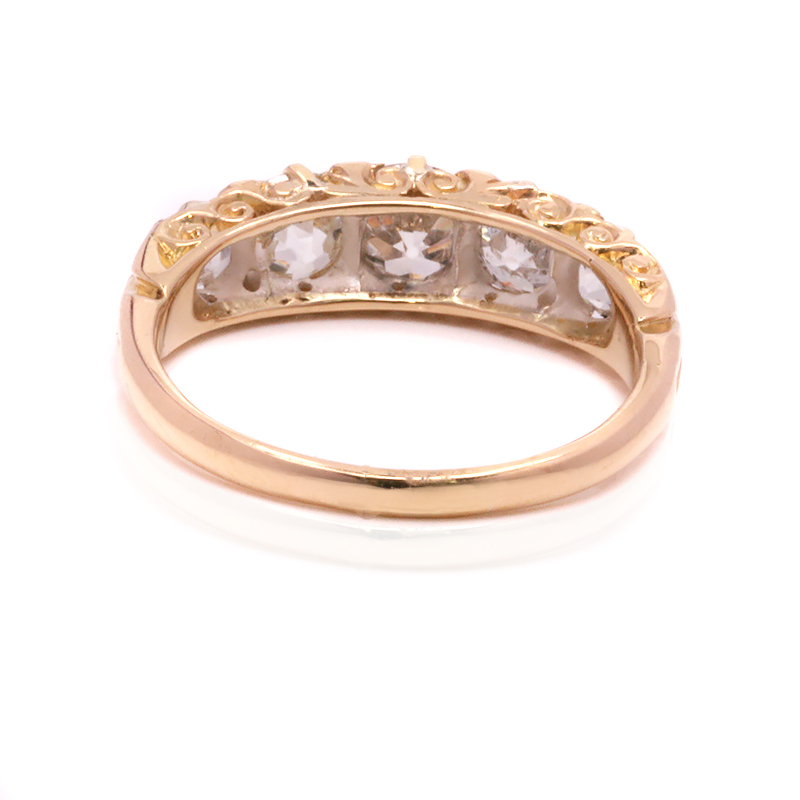 Product code: es8203 Categories: Antique, Antique Engagement Rings, Antique Rings. The detail from the top and the sides in this antique diamond engagement ring from the Victorian era is just divine and so beautiful and is a real testament to what could be made all those years ago without any modern technology. Set with five antique European cut diamonds that total 1.82 carats, there are also eight smaller rose cut diamonds that total 0.04 carats and are set in pairs between each larger diamond. This subtle yet elegant use of smaller diamonds really adds to the charm and character that is only found in antique rings. Measuring 6.2mm wide at the centre by 20mm across, this ring looks so stylish on its own or with a wedding band sitting along side. And then admiring the ring from the side will take your breath away when you see the magnificent scroll work that was so beautifully hand made all those years ago. Hand made rings are so much stronger than cast made rings and this is so evident in this ring being over 100 years old and still in fantastic condition. From every angle and every side, this is such a stunning example of an antique diamond engagement ring that will always be loved and cherished. Tag: Antique diamond engagemen ring. 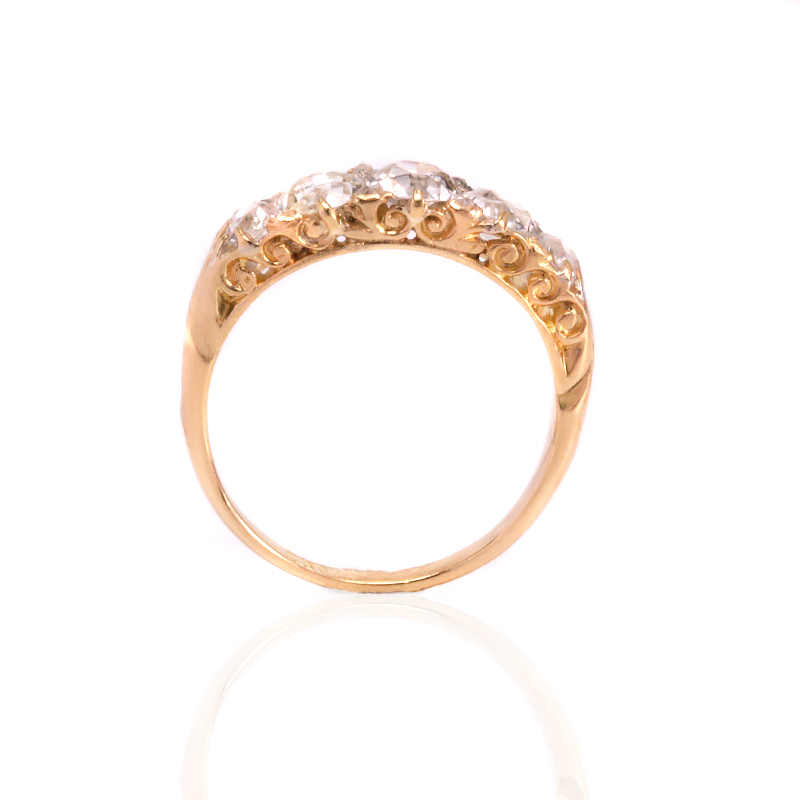 Hand made in 18 carat yellow gold and will easily allow a wedding band to sit along side. This antique diamond engagement ring is set with antique European cut diamonds and rose cut diamonds. With divine scroll work on the side, it is typical of an engagement ring of the late Victorian era of the 1890’s that is so popular and sought after today. 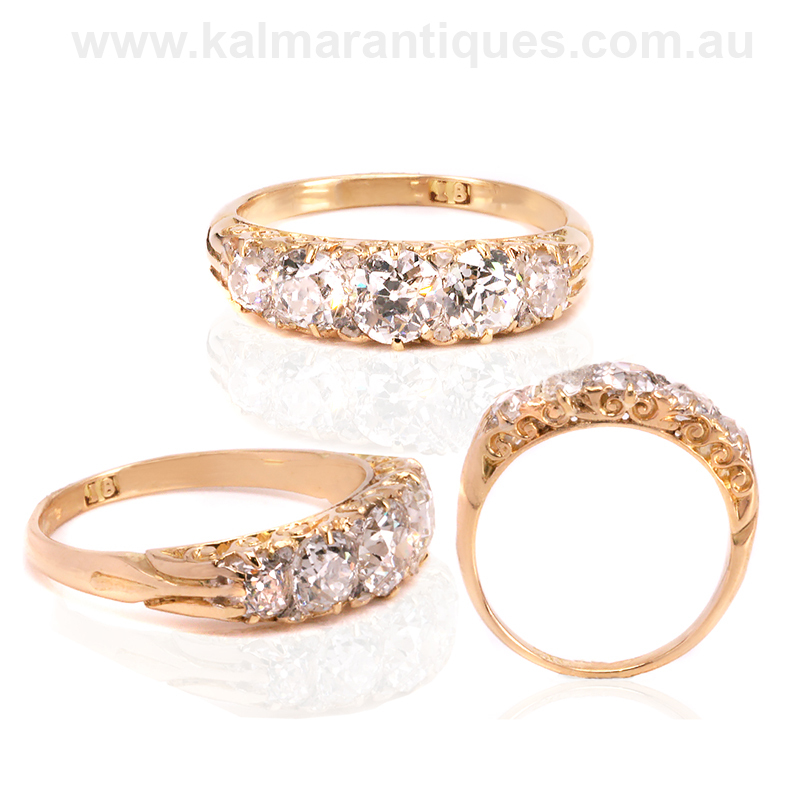 At Kalmar Antiques, we pride ourselves on having the finest range of genuine antique diamond engagement rings in Sydney.